1 If you have ever heard the song, Pop Goes the Weasel, you know that there is a surprise at the end of the song. The art world had a surprise that goes pop, too. It is called pop art. 2 Pop art shows everyday items as its subjects. It could be a painting of a Campbell's soup can or the American flag. Pop artists were inspired by television and ads and movies. They also used comic strips and billboards. 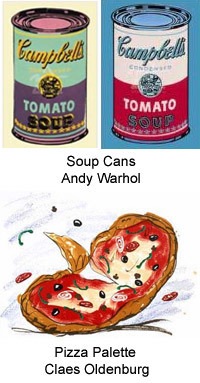 3 Pop art started in the 1960s. Pop artists noticed that after World War II, there were more ads than ever before. People had many new things to buy. Pop artists used the ads for these products in their work. Feedback on Pop Goes Art!